Oh my goodness, where do I even begin?? 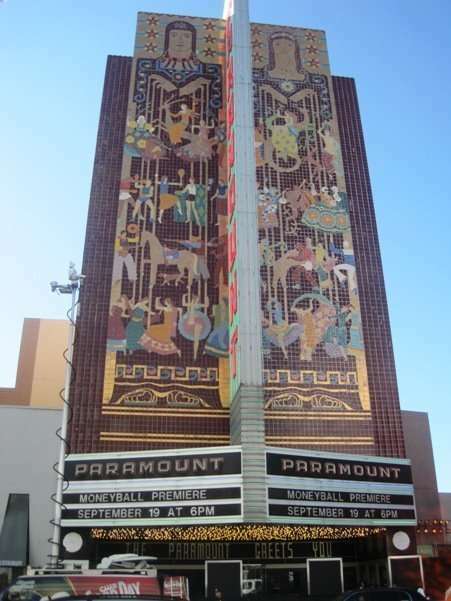 The world premiere of Moneyball starring Brad Pitt, Jonah Hill, and Philip Seymour Hoffman was this evening at the Paramount Theatre in Oakland, CA; and while I decided against plunking down $100 to watch the movie (yeah, I’m cheap; what of it? ), I did make it to the “green carpet” beforehand. Brad Pitt was literally two feet away from me. I kid you not. 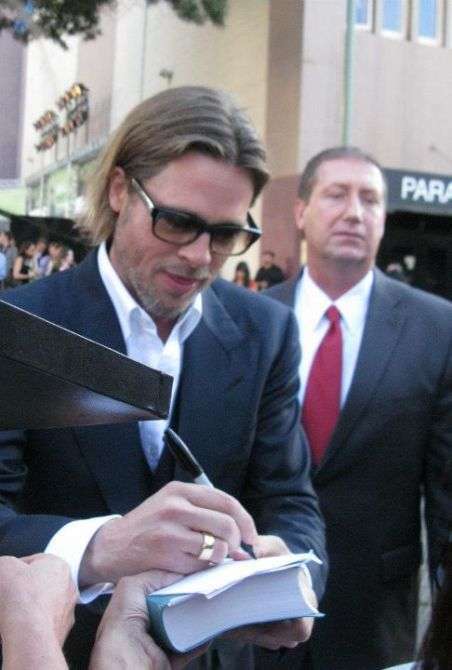 That’s my hand, so yeah…..I’m TOTALLY in a picture with Mr. Pitt. Jealous, much? 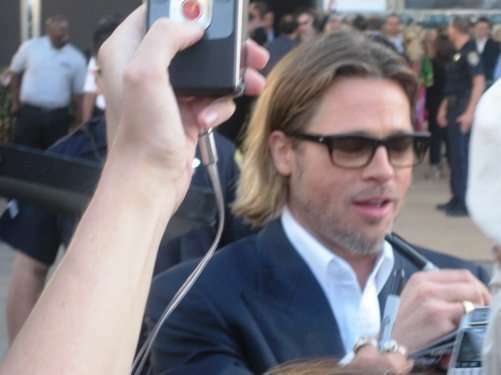 Here’s even better proof (if you can handle the annoying notebook that the child next to me insisted on shoving in front of my camera)…..
Weird, I swear I hear someone yelling “Super Star Gossip” at Brad Pitt in the video below. Wonder who that could have been…..
Jonah Hill made an appearance too and was a great sport, high-fiving the first row of fans. Homeboy is lookin’ G-O-O-D, by the way. 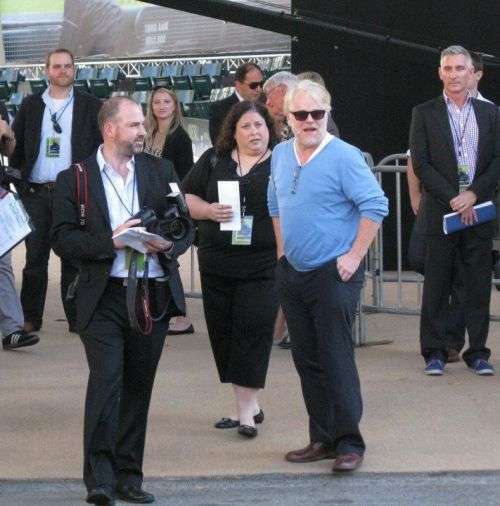 Philip Seymour Hoffman wasn’t quite as crowd-friendly, but he was kind enough to wear a bright colored shirt that made him easily visible from across the street when he waved at us. When he did manage a short visit over to us, he was too far down the line from me for my heart to flutter. A few more pictures of Brad Pitt, because, well…..why the hell not? I must give credit were credit is due, so thank you L.M. of the fashion site Bringing Back The Sweater Vest, for her high-quality pictures today. The experience wouldn’t have been the same without you!! 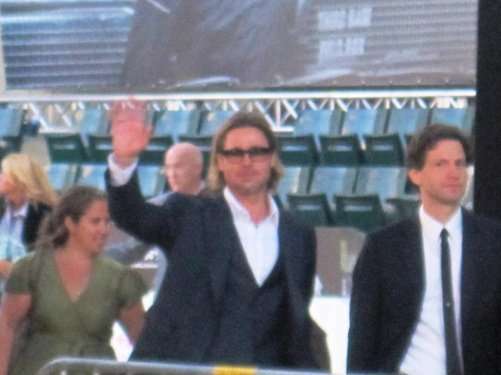 For all our pictures from the Moneyball premiere, visit my Moneyball Premiere Facebook album. Oh! 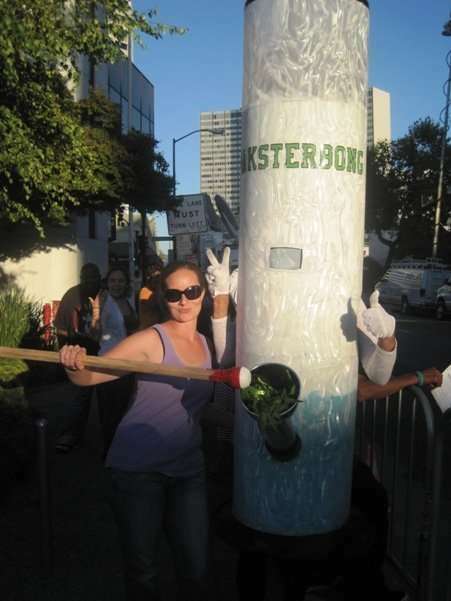 I almost forgot…..After all the stars went inside for the movie, we were visited by a gigantic bong. Yes, really…..
50 queries in 0.704 seconds.